US Secretary of State Mike Pompeo will meet a top aide to North Korean leader Kim Jong Un in New York on Thursday, the State Department said. The US chief diplomat and Kim Yong Chol “will discuss making progress on all four pillars of the Singapore Summit joint statement, including achieving the final, fully verified denuclearisation,” a statement said, referring to the June meeting between President Donald Trump and North Korean leader Kim Jong Un. The New York meeting comes with the two sides at loggerheads nearly five months after the summit, in which Trump and Kim pledged to work toward denuclearising the Korean peninsula. North Korea’s foreign ministry has warned that Pyongyang will “seriously” consider reviving its nuclear weapons programme unless US sanctions are lifted. 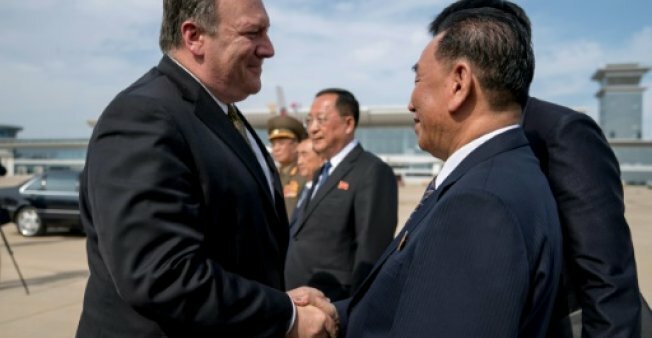 In announcing the meeting with Kim Yong Chol, Pompeo said he expected to “make some real progress” including on laying the groundwork for a second summit between Trump and Kim Jong Un. He visited the White House in the diplomatic run-up to the Singapore summit, and has been Pompeo’s chief interlocutor in the months since. In mid-October, Pompeo invoked the possibility of a second summit, preceded by talks with Kim Yong Chol. “We’re working on finding dates and times and places that will work for each of the two leaders,” Pompeo said at the time. Despite a lack of visible progression in talks, Trump has often pointed to the detente with North Koreathe subject of saber-rattling rhetoric and soaring tensions early in his termas a signature foreign policy accomplishment.